Stainless Steel Lobster Clasps, SSLC01, are polished to the mirror finish. They can be used with any bracelet chains, beaded bracelets or necklaces. 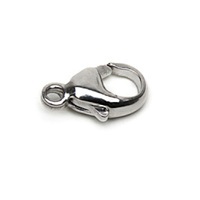 Lobster clasp is preferable for bracelets, which should be opened and closed often enough (daily).